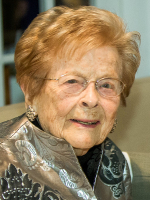 MENANDS – Shirley Jean Herdman Gillett Curtis passed away at her home in Menands, New York on December 24, 2017 at the age of 101. Born in Montreal, Quebec, Canada, on February 8, 1916, she was the daughter of the late Lorne Herdman and Stella Lynn. She was pre-deceased by her husbands George Herbert Gillett and Walter Stanley Curtis and by her sisters Lorna Willis and Paula Bremner. She is survived by her son, Peter George Gillett (Paula), daughter Shirley Anne Older (Thomas), six grandchildren and fourteen great grandchildren. Educated at St. Helen’s Anglican Girls School, in Dunham, Quebec (1933) and Miss Graham’s Business College in Montreal (1934 with honours), she worked for the Canadian General Electric Company until her marriage in 1936. She was the recipient of piano training from an early age, and, throughout her life, continued her studies, taught children and adults and held recitals. Appreciation of music was a major legacy to her family and friends. In 2001, at the age of 85, she published her memoirs entitled “Recollections”. She also recorded 3 albums of her piano music. Her contributions to the cultural life of Albany were acknowledged by the Capital District Senior Issues Forum when they awarded her a Senior Lifetime Achievement Award in 2002. Always stylish, she enjoyed gardening and entertaining. She was a devoted matriarch who inspired and mentored her family. To her friends she was concerned, loyal and compassionate. She will be remembered with a great deal of love and affection by all who knew her. The family would like to thank the many friends and caregivers who made her last years comfortable. Those who wish may consider a donation to the Northeastern Association for the Blind at Albany which was particularly helpful to her. A celebration of her life is scheduled for February 3, 2018 at 10:30am at the Cathedral of All Saints at 62 South Swan Street, Albany, New York. A reception for family and friends will be held at the Fort Orange Club immediately following. Should you wish to remember her, take a few minutes to listen to Op. 90/4, her favorite of Schubert’s Impromptus. Dear Peter and family. My sincere condolences to you all. What a wonderful woman your mother was. She obviously enjoyed and made the most of her life, something that we all should do. What an inspiration she is to your children and grandchildren. It is with great sympathy that we learn of the “passing“ of Peter`s`s mother. As I can read, she was blessed with a full , long and healthy life. You, her family, children and friends, have to be thankful to have had the priviledge of knowing her. Blessings and good health to you all! We were very fortunate to have been a neighbor and friend to Shirley. What a beautiful and remarkable woman. My Deepest Sympathy, Peter. I just received the notice of you Mother’s death. Shirley Curtis was an inspiration to everyone in the Capital District music community. She set a beautiful example of a life devoted to and enriched by music, and she gave so many others the gifts of musical skill and joy. She will be missed but she will not be forgotten. Listening to Schubert’s impromptus now . . .
Dear Peter and family: So sorry to hear about your loss. Your mother sounds likes she was a wonderful lady!!! I am so sure you have great memories of her. She will be missed by many and will leave a lasting legacy of her musical talents. What a pleasure and honor to know Shirley. She was a wonderful piano teacher to our children, a kind and dear neighbor who knew how to garden, a great lady who knew how to dress on Halloween for all the trick or treaters, and a dear dear friend . My family and I were so sorry to learn of Mrs. Curtis’s death. She was an extraordinary woman. Our oldest son, Aaron, took piano lessons with her from third grade through his senior year in high school. During his time with her he learned so much more than playing the piano. Through her example she taught, gently but emphatically , the value of striving for excellence while being thoughtful, kind and patient. My husband and I really enjoyed our interactions wth her as well. Her commitment to her students was beautiful to watch. We’ll always remember her for her effort, her warm smile and her preserverance in the face of difficulty.